Prestage Foods of Iowa selects Wright County, Iowa, for new pork processing facility. 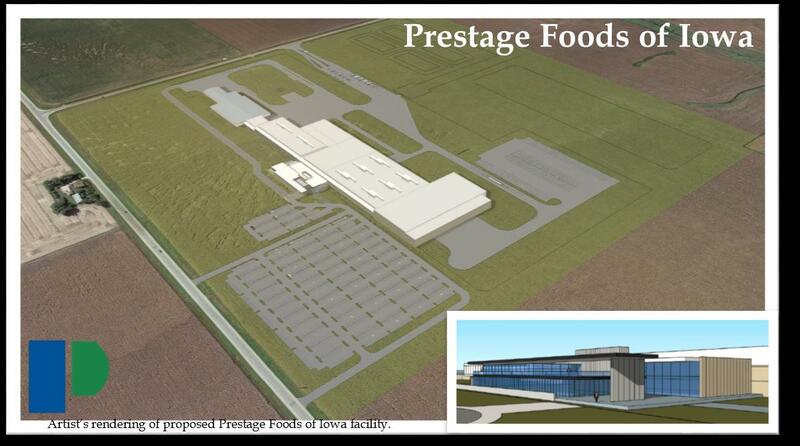 Prestage Foods of Iowa LLC announced July 5 that its new, state-of-the-art pork processing facility will be located in Wright County, Iowa. The plant will be a $43 million boost to the payroll in Wright County, and will have economic benefits to the surrounding counties as well. More than 900 new full-time jobs will be created with the lowest paid workers beginning at more than $37,000 per year plus full benefits, the announcement said, noting that average wages at the plant are expected to be more than $47,000. “We are excited to have Prestage Foods of Iowa construct their first pork processing plant in Wright County,” Wright County economic development director Bryce Davis said. “Agriculture is important to this county and to our state and we welcome the more than 900 new jobs and $240 million investment in this area. After discussions with the Iowa Economic Development Authority, the Wright County Board of Supervisors, local business owners, community organizations, regional partners, schools and healthcare providers, we believe the plant will be an extremely positive addition to our community." Prestage Farms has been raising pigs in Iowa for more than a decade and today is located in 30 Iowa counties. The company plans to buy 40% of the hogs for the plant from independent farmers, creating a new market option for those farmers. “Prestage fits well with Iowa because, like so many Iowans, our roots are in agriculture and we value our families and communities. Our commitment to local communities and our care for the environment and being good neighbors will continue,” added Scott Prestage. The new plant will use state-of-the-art systems to clean the air, reduce water and energy needs and provide a safe work environment. For example, the plant will use the most modern “air scrubbing” technology and incorporate a water reuse program, which reduces the overall needs for water and wastewater treatment. The plant will utilize the latest innovations in processing and automation technology to help ensure that it is a world leader in food, employee and environmental safety. Construction is set to begin in the fall of 2016, pending finalization of county and state approvals, with completion and first shift operations beginning in mid-2018. Initially operating one shift, the plant will employ more than 900 people with a total capital investment of more than $240 million. Prestage Farms Inc. is a multi-generational family-owned and operated business started by Bill and Marsha Prestage in 1983, who, along with their three sons, still own and actively operate this multifaceted business. Today, Prestage Farms, along with its affiliates, is a top five producer of pork and turkey and employs more than 2,000 people company-wide, contracts with more than 450 farm families in seven states, and produces more than 1 billion lb. of meat annually. Prestage Farms Inc. is headquartered in Clinton, N.C., and has operations in Iowa, South Carolina, Mississippi, Alabama, Texas and Oklahoma.